Mary D. Hume was build in 1881 by R.D. Hume for his Cannery in Gold Beach. He named the ship after his wife. Over the years, different owners reconstructed it and it has been used for many purposes around Gold Beach on the Oregon Coast. Back in the 1970s it even had the title as the oldest serving commercial vessel. When good old Mary D. Hume retired in 1978, they tried to make her into a museum ship with no luck. 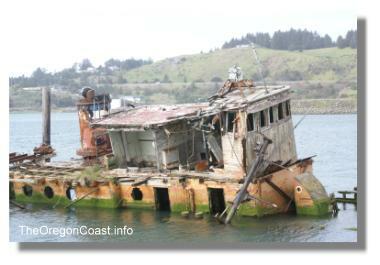 Although Mary D. Hume is on the National Register of Historic Places, she is not maintained and she is slowly breaking apart and sliding into the Gold Beach muddy waters. The Oregon Coast Visitors Guide made a Mary D. Hume Video for your enjoyment.